Thinking of building a PC from scratch and on a budget? Maybe you should consider a cardboard case like the one below? Sounds odd, but when you think about it there are many things that you could fit a PC inside. All you need is an ATX PSU (Power Supply Unit) and a switch off an old power supply (ATX style only), or you could make your own Switch/Reset using momentary switches from Maplin or the like. If you fancy creating your own ATX switch and reset button, it's easy check out this site. 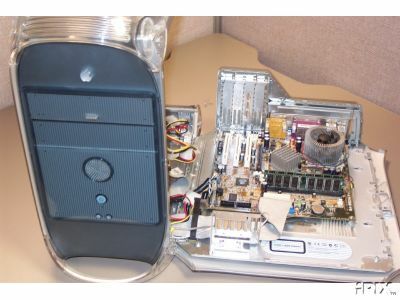 Maybe if you have an old G4 lying about you could convert the innards into a PC! Trying to increase your PageRank in Google? Maybe this is could help your site. I've created a links page on my site (see link below) which you can add your URL, providing your website is of similar web development content it will be accepted pending human verification at a later date. Before submission of your link you will be required to link to nikmakris.com. Your site will then be checked for the reciprocal link automatically and if it passes you will be added to nikmakris.com links page. How will this help your site? Google uses an algorithm called PageRank, which gauges the usefulness of your pages based on the amount of inbound links to your pages. Each page has it's own Page Rank. When you link to a page on another site you are essentially "voting" for that site. The site you link to will gain a proportion of the PageRank of that page depending on the amount of links on that page and if that page has any Page Rank at all. If the page you link to also links to you, you will receive a "vote" as well. PageRank is a multiplier which when combined with good search engine optimised HTML will give you much higher rankings in Google. So the higher Page Rank you have the better. An indication of your PageRank can be found out if you install the Google Toolbar with advanced features from www.toolbar.google.com, although this is only an indicator since PageRank is logarithmic. Why study for a Cisco CCNA ? CCNA - Cisco Certified Network Associate, is a certification for people looking to gain a high level of knowledge in networking and Cisco products. It is also a prerequisite for other high level Cisco certifications, such as CCNP, CCIE. There are two ways to train for this exam. You can either buy a book and learn yourself, (I bought the book below which is very useful, and I read it cover to cover before taking the exam) this method is good, but you will miss out on practical experience unless you have a couple of Cisco routers lying about in your garage. You can buy Cisco simulators which you can practise on, but I didn't like these too much. The other way is to check out your local colleges for evening classes or boot camps, which will aid your learning providing you with exposure to Cisco equipment and teachers knowledge. The CCNA 640-607 is a 75 minute exam with a varying number of questions. This exam is fairly difficult and you need to know your stuff inside out! The Cisco Networking Academy is an online learning resource which will guide you through the CCNA pathway, providing online assessment, training and hands-on labs. Below is the Cisco Threaded Case Study (TCS) that I was involved with while studying for my CCNA. A similar case study will need to be undertaken by you if you choose to study the Cisco Networking Academy.